Pegasus™ 10 | Strobes & Beacons | Adams Industries, Inc.
Pegasus™ 10 is a flashing infrared signaling beacon designed for use during low light operations. Engineered as an enhancement of the Phoenix Jr. (Firefly) (NSN: 5855-01 -438-4588) infrared beacon, the Pegasus 10 provides the same fixed flash pattern, but with the ability to adjust the beacons signal brightness. At times the mission requires a reduced flash signature to prevent unwanted detection, the Pegasus10 beacon has a dimming feature that can be used to limit the beacons signal broadcast range. Operators can now tailor their signal to a very low level for short range detection or adjust to full power to signal aircraft at range. 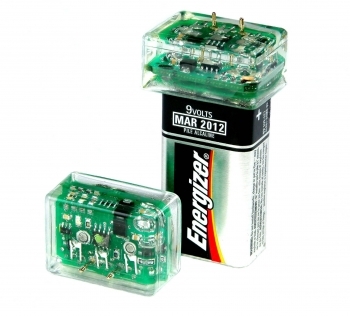 The user can quickly adjust the beacons signal strength via the beacons two programming pins. When activated, miniature indicator lights within the device will temporarily flash allowing the operator to visually confirm that the beacon is operating correctly in situations where their own night vision equipment has become lost or damaged. Operating Depth: The Poseidon — Phoenix / Pegasus Mounting Clip (902801) provides a water tight casing for the beacon and battery assembly. If immersed without the Poseidon case, the unit will continue to operate until the contacts fail due to water and electrolytic corrosion. Given these conditions the depth limitation is solely determined by the battery’s ability to withstand depth.